I had to speak in sacrament meeting on Father's Day. It was my husband's third such assignment in his seven years of fatherhood, so I couldn't complain. I decided to talk about Heavenly Father rather than the more commonly discussed earthly variety. I read a great talk by Elder Holland called The Grandeur of God that will make you want to think more about the subject after reading this post. I once knew a man with the kindest eyes. Pale blue, with deep crow's feet that smiled and moved along with the rest of his face. I've always considered these eyes to be what looking at Heavenly Father would be like—not the penetrating gaze of Elder Scott that always makes me feel like I've done something wrong. More like a wise, worn man who knows me and knows everything and is trying to help me figure it out too. This same man once told me something that Lowell Bennion, educator and writer and philosopher, said or wrote. "God is at least as good as the best person you know." Of course, Google has no results for such a search phrase and I only have a notation written in a notebook of this quote, so take it for what you will. But I've found this to be a good thought exercise, especially when realizing that I haven't lived up to what I know and what I should be. The best people we know don't want to keep us down but want to help us be better. Heavenly Father is certainly at least that good. General Authorities sustaining themselves in their callings during General Conference. 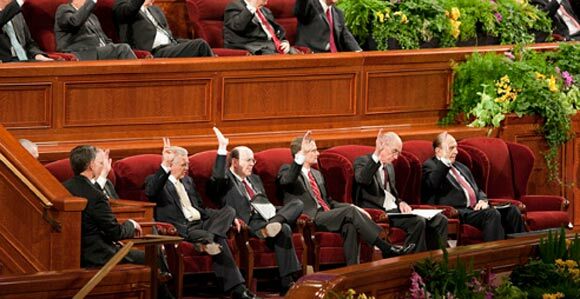 Notice how Elder Christofferson is flashing the peace sign. Right-on Brother. Almost 11 years ago I was baptised in a large semi-rural ward in Utah. Living in a town where 80% of the population were already members and those remaining were unlikely to be so in this life, I was the ward's only convert baptism for years. After a few weeks of me being a member, the bishop was prompted to open a dusty, seldom used drawer to pull out a New Member Checklist. The good bishop was determined to ensure I had the three things each new member needs: a friend, a responsibility and nurturing with "the Good Word of God". The friend bit was easy: I was engaged to another member of his ward (she was very friendly!). The nurturing with "the Good Word of God" is a humorous story for a coming month. The calling bit was the challenge that dragged on for many weeks. One Sunday, after the church meetings were over, I was asked to stay behind and have a meeting with the bishop. This was to be my first one-on-one meeting with him and the expectation was that I would receive a calling. Back in 2002, the church was then releasing stake and ward websites for US based units with calendars, meeting times, etc. The bishop knew I was a recent computer science graduate and I expected that my first assignment would be to administer the new ward website. NOTE: This is the third installment in a series of posts that piece together things I've learned over the last eight years of using my life like a lab rat to figure out the question "what should I do with my life?" This series is aimed at those who are exploring career, looking to change jobs, or who are simply searching for more happiness in their daily work regardless of what that work entails. Read Part 1 or Part 2. Yesterday I ate lunch with a friend and we were talking about what in the world drove him to major in bio-engineering. He said he showed up at Rice University and asked around to find out what the hardest major was and then signed up for that. He's obviously driven by different values than I am. Pretty much any hard class or major I ever came across at BYU-Idaho got the ol' "sayonara." But he illustrates an interesting point: People land in majors and careers for really random reasons. You might be able to relate. I know I can. I chose public relations as a sophomore because I met with a career counselor who asked me what I like to do and I said "work with people" (just like virtually every other human being on planet earth). He said, "Do you feel like you can relate well with them?" I thought about it and said, "Oh yeah. Actually I do that really well." "Then you should go into public relations," was the reply. So I went into PR. The joke was on me when two years later I was gainfully employed at a top-tier PR firm in Dallas sitting in a "call booth" cold-calling media from wellness magazines to pitch them my client, Beano, and it's discovery of Complex Carbohydrate Intolerance (aka stinky toots). Choosing a major or career is tricky because we don't know how to approach it and our default strategy is random. My dad was a _____ so I will be too (as if career is consistently passed through the blood line). XYZ career path pays really well so I'll do that. XYZ major only takes _____ credits to graduate. Let's do this! I really liked studying the Renaissance in high school, so I'll be an English major. I loved Mr. Jones, my high school math teacher. He changed my life. I'll be a math major. My parents are paying for my schooling and they said, "We're not paying for you to go to ABC school to get a degree in that!" 1. It takes a lot of time to find a job you love. The common refrain is, "You can do anything for a year." While this is true, and I've definitely had my fair share of one-year jobs, an accumulation of one-year positions over a career can be detrimental because you may never get very much depth in any one career. You may select a major or career path, try it out for a year, bail and move on the next, try it for a year, and so on. People say, "Just dive in. You'll figure it out." While true, it's also very time-consuming and frustrating. 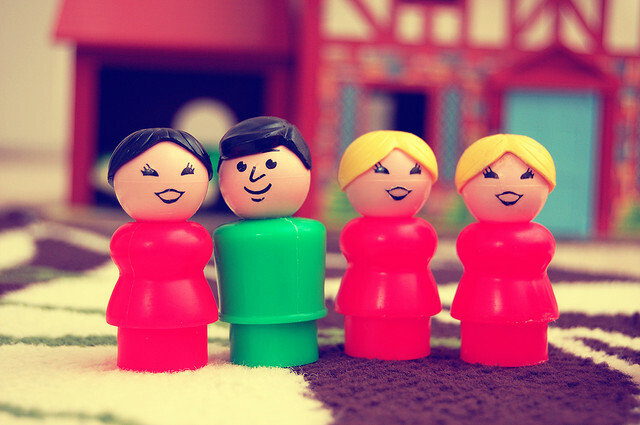 What's the Big Deal with Polygamy Anyway? I had originally planned on doing a post on this a year ago but I held off. Now that polygamy is in the news again because of what is going on with gay marriage (see here, here or here) I figured I could dust this off. Way back when I was a guest poster I had published some emails my brother and I had exchanged on the topic of inoculation. Below is another thread we had going on polygamy. What had sparked the conversation was an ignorant explanation from Glenn Beck about why we Mormons practiced polygamy (this was during Romney's campaign for the presidency and Beck was trying to normalize Mormons I think). The question I had for my brother (and what I want to put to you folks) is this: aside from getting kicked out of the church, what's wrong with polygamy? 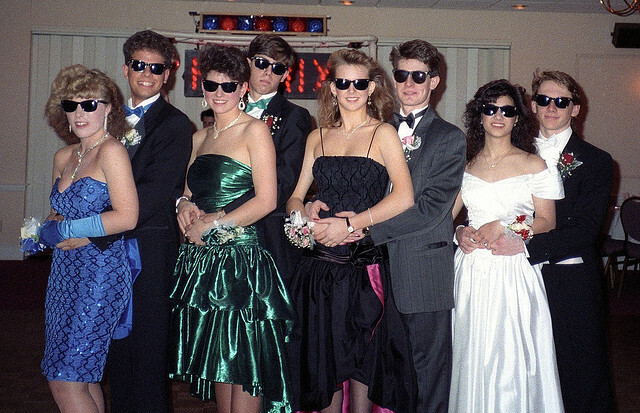 As a side note, I don't want anyone to think I'm advocating for a return to polygamy. I'm not. I'm just curious why polygamy is viewed in such a negative light in today's society. Sorry, I just heard more Glenn Beck's explanation for pgmay. He said, "When the Mormons got to Utah and they weren't persecuted anymore, p'gamy stopped." Nothing could be further from the truth. 1852 was when it was publicly announced by Orson Pratt. I don't get why Glenn would not know this. Heck, the OD at the back of the D&C makes it explicit that we were doing it until 1890. We even did it after that but not publicly. 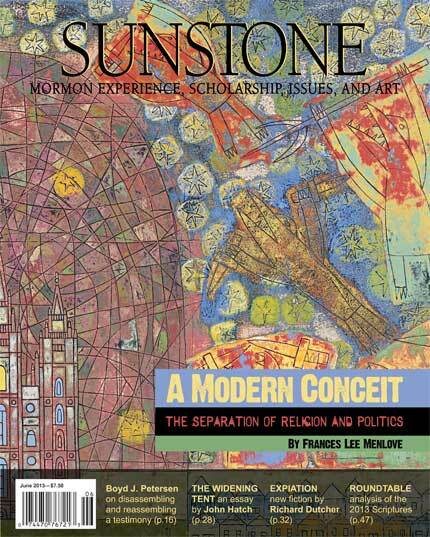 There is a New York Times article making the rounds among Mormons that describes, among other things, Hans Mattsson’s crisis of faith. It features four bullet points with issues that seem to disturb those members who seek for greater understanding and do not find it in traditional settings or sources. Those points include how Joseph translated the Book of Mormon, the priesthood ban on those of African descent, the Book of Abraham as a translation and Joseph Smith's practice of polygamy. The article seems fair and useful, genuinely reflecting a crisis many experience. As a response to this situation, a scripture comes to mind: D&C 38:30. I tell you these things because of your prayers; wherefore, treasure up wisdom in your bosoms, lest the wickedness of men reveal these things unto you by their wickedness, in a manner which shall speak in your ears with a voice louder than that which shall shake the earth; but if ye are prepared ye shall not fear. This scripture seems pertinent precisely because the above issues are not plainly or clearly addressed in traditional LDS settings or sources. I have never heard any of them addressed directly or thoroughly in a conference talk or in any stake or local setting. Nor are they addressed in the CES curriculum, from what I have seen. And the danger in not addressing them is that those with wicked intent may raise such issues in an overwhelming, faith-destroying manner. Those exploring these and other issues may come to fear that the Church is hiding something or at least whitewashing its history. One may even feel deceived, left to wonder what other secrets lurk in the dark. So, as this blog addresses modern Mormon men, many of whom are fathers, what do you do or what might you do to prepare your children to deal with these issues? How do you help them "treasure up wisdom" to protect them from the deafening noise of cynics or destroyers of their faith? How do you prepare them so that everyone experiences more faith and less fear? I have provided one small suggestion on an earlier post and I contribute to a blog that attempts to use humor to diffuse some of the emotional, mental, and spiritual conflict that might surround such issues. What do you do? The Mutual Theme for 2013 is "Stand Ye in Holy Places" and our ward carried this theme into this year's Youth Conference. One of the ongoing discussions between the leaders and the youth has been about what constitutes a holy place, in daily life and also in church service such as temples, chapels, and full-time missionary work. The discussion in our ward prompted me to think about some of the holy places in my own life and how they helped build a foundation of testimony and faith. To express these thoughts in a visual fashion, I created two Venn Diagrams, purely for interests' sake. Coming from two broken homes, I am deeply grateful for Elder David A. Bednar's General Conference sermon in October 2009 regarding family and being "more diligent and concerned at home." The counsel is necessary. The world, through media messages and lifestyle, tries to cajole, seduce, drag, pull, push, and persuade us away from what matters most: our marriages and our families. When I was learning about the LDS Church, two of the first quotes from a prophet I can remember learning were Presidents Harold B. Lee's and David O. McKay's resonating statements: "The greatest work you will ever do will be within the walls of your own home." and "No success can compensate for failure in the home." Now, choosing to become a lawyer and take on the time demands of such a profession can be counter intuitive to President McKay's counsel. But, I am not interested in working for a "white shoe" gigantic law firm where I will be grounded to associate dust after years of 90-hour work weeks. I'm looking for a job that is more in line with Presidents Lee's and McKay's points, for at the end of my days on this earth I really won't lament the fact that I didn't spend one more hour in a meeting or at my desk at work. What I will lament, if I don't become "more diligent and concerned at home," is not playing with my boys more or going on more dates with my wife. Those are the things of "wailing and gnashing of teeth." Regret. Brethren and sisters, when was the last time you bore testimony to your eternal companion? Parents, when was the last time you declared your witness to your children about the things you know to be true? And children, when was the last time you shared your testimony with your parents and family? As our sons were growing up, our family did what you have done and what you now do. We had regular family prayer, scripture study, and family home evening. Now, I am sure what I am about to describe has never occurred in your home, but it did in ours. Sometimes Sister Bednar and I wondered if our efforts to do these spiritually essential things were worthwhile. Now and then verses of scripture were read amid outbursts such as "He’s touching me!" "Make him stop looking at me!" "Mom, he’s breathing my air!" Sincere prayers occasionally were interrupted with giggling and poking. And with active, rambunctious boys, family home evening lessons did not always produce high levels of edification. 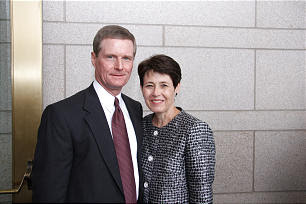 At times Sister Bednar and I were exasperated because the righteous habits we worked so hard to foster did not seem to yield immediately the spiritual results we wanted and expected. The title of Elder Bednar's talk makes me think that there may be more than the three ways Elder Bednar suggests for us to be "more diligent and concerned at home." 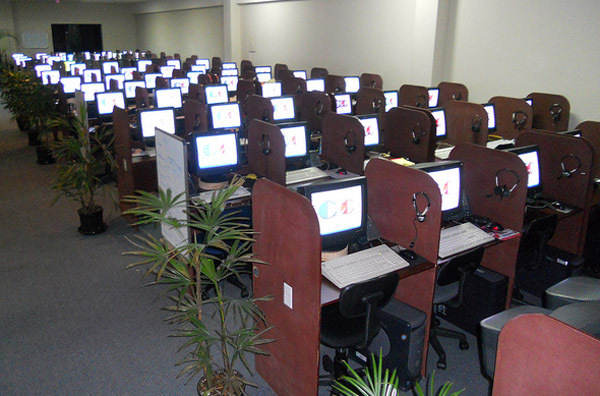 How are you "more diligent" at home? How are you "more ... concerned" at home? Mob A group of people whipped into such a frenzy by evil leaders that they are incapable of reason or empathy in their urge to destroy an innocent victim. Not to be confused with groups of concerned citizens who are so inspired in righteous indignation by defenders of morality that they have no further need of discussion or delay in their crusade to destroy the forces of sin. Mormons People who believe: 1. That a small family is one with only four children. 2. That if they ever get in real trouble, one of the Three Nephites will help them out. 3. That the only difference between them and God is a few years of training. Mother in Heaven The mother of our spirits, who after years of anonymity has developed something of a fan club among believers in the ERA. Mother in Zion The position a Mormon woman is given as a reward for good behavior in her teens. As a mother in Zion she has the privilege of changing thousands of diapers, drying gallons of tears, spraying Bactine on hundreds of scrapes, washing millions of dishes, and reading The Little Engine That Could out loud until she can recite it backward. All she has to do to remain in this enviable office is keep herself lovely, youthful, and enthusiastic enough that her husband stays interested in her. Mountain Meadows Massacre An unfortunate incident in which John D. Lee, a master of disguise, dressed up as dozens of Indians and single-handedly wiped out all the men, women, and children in a wagon train of Missourians passing through southern Utah. Mouth When a group of priesthood holders take part in the laying on of hands, only one of them, called the "mouth," speaks for all. Those who have had their necks nearly broken by the weight of twenty-eight hands on their head have wished for many mouths and only one hand. In the past month I have taken two trips. On one, my son flew with me to Washington DC. The four-hour flight seemed unbelievably long, uncomfortable, and stressful. My travel office had made great arrangements for travel and lodging, yet travel was still crazy as I navigated the hurry-up-and-wait airport mentality. DC is amazing though, and we literally ran to see all the sites and attractions. The second trip was decided when we noticed that the 4th of July week gave us the best chance of avoiding conflicts with camps of all kinds (i.e. sports, scouts, student council, etc.) My brother-in-law lives in Oklahoma, certainly a place not known as a destination the caliber of Washington DC from a tourist perspective. However, we decided a 2000 mile round-trip drive would be feasible. So we loaded the family for an old-fashioned road trip, resulting in a fabulous and memorable experience. 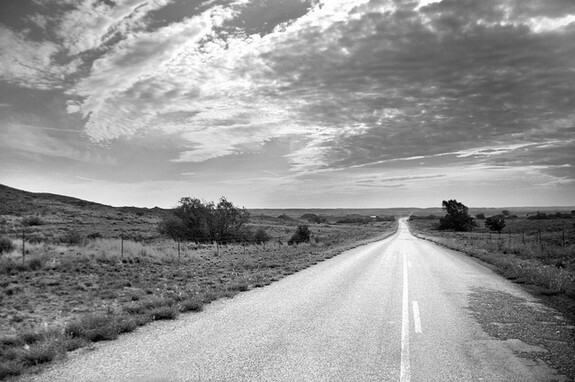 The trip was old-fashioned in the way that most of us remember getting in the car and going to visit family down long stretches of lonely highway. Thankfully, vehicles have evolved significantly to provide a little more interior room, quite a bit less exterior room, and features like DVD players, better acoustics than 8-track players could have dreamed of, and air-conditioning that doesn't come from rolled down windows. 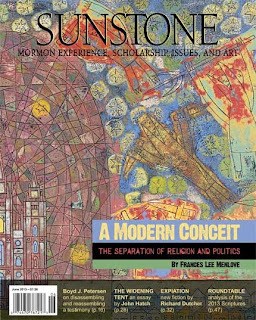 Nancy Ross and Jessica Finnigan are writing an academic paper on Mormon feminist identity and responses to the Mormon Spring. 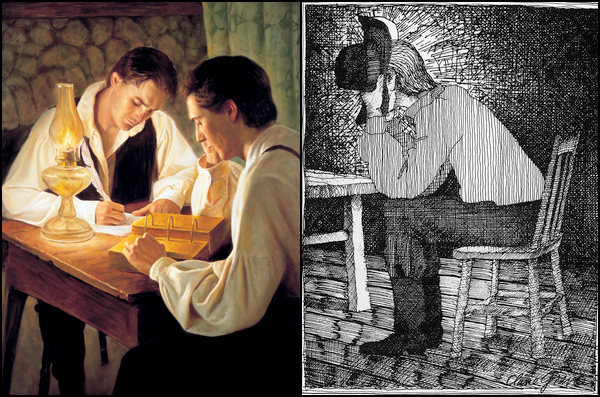 We’re defining the Mormon Spring as the recent changes in church policy together with online activism and activity on the Bloggernacle, from 2012 onward. We need adults, men and women, who identify as Mormon feminists to take this survey. If you identify as Mormon feminist, but have not been baptized, you can still participate in the survey. Our paper will be published in an academic journal. 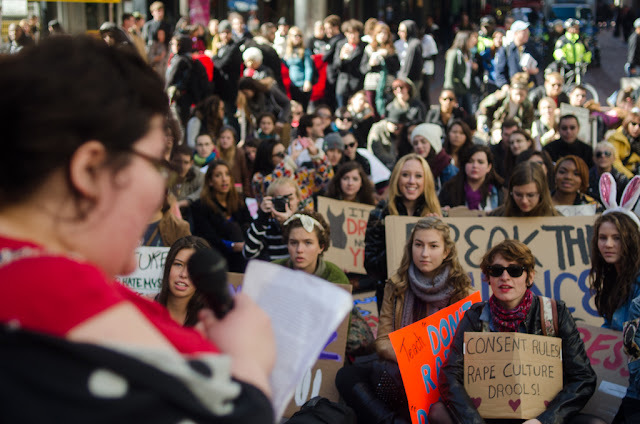 While that may not sound exciting, it is an opportunity to tell people outside of the Bloggernacle about Mormon feminism. I listened recently to the radio with fascination as a spokesperson for the Mars One Foundation spoke about their effort to colonize Mars with humans in 2023; in just 10 years. They’re currently accepting applications from earthlings interested in a one-way trip to the Red Planet. She described all the technology, partners and preparations now underway to make the human mission to Mars a reality. She said in no uncertain terms that it will happen. When questioned about why they would want to send humans to live on Mars, her response shocked me. Before I tell you what she said, you should know that I am a Star Wars and Star Trek fan. I’m not a fanatic, but I always see and enjoy the movies. I also believe space exploration will continue to be part of our existence. Suggestion sent in by a MMM reader. See all Doppelgängers here. Brynner: A great believer in rituals. 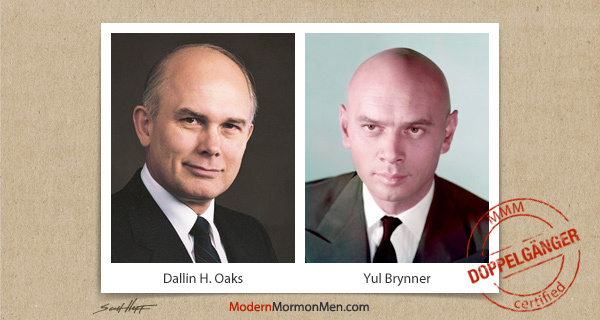 Oaks: A great believer in rituals. Brynner: Died the same day as Orson Welles. Oaks: Born the same day as Charlie O'Donnell. In the church we often talk about the pride cycle. To the side is a diagram that we commonly use. Starting from the bottom, we see how sometimes people who are experiencing destruction or suffering will repent and humble themselves. Such humility and repentance brings about righteousness and prosperity. This is called the pride cycle because of what happens next: people stop relying upon the Lord and instead become proud and wicked. This wickedness inevitably leads to destruction and suffering, and the cycle starts again. 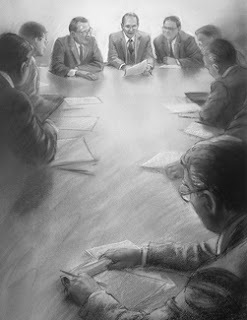 We often talk about the cycle as something that is clearly seen in the Book of Mormon. 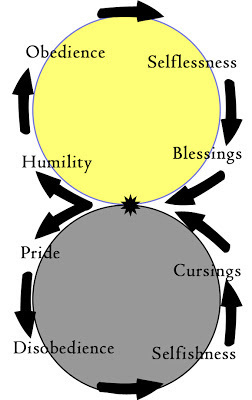 The problem with this diagram is that it makes it seem like pride and wickedness are inevitable. It gives the impression that righteous and prosperous people cannot help but eventually become proud and wicked. I don't think that that is the message of the Book of Mormon. So here's an alternative diagram. This diagram is a little harder to read, but here goes. You start in the very center, with the star-like object. This is the choosing point. In our lives, we are constantly choosing. We can choose to be humble or to be proud. We follow one of those two arrows. When we go down and choose pride, we also choose disobedience. Disobedience leads to selfishness. Selfishness leads to cursings, or the destruction and suffering of the original diagram. But that leads us right back to the choosing point. Sometimes, though not always, cursings (suffering and destruction) help us to become humble. At the choosing point we can choose to be humble. Humility leads to obedience, as we see in the top half of the diagram. Obedience leads to selflessness, and selflessness leads to blessings. But just like the cursings, blessings also lead us back to the choosing point. So what is the advantage of this more complicated diagram? Well it shows how wicked people can become more and more filled with pride. Such people consistently choose pride at every choosing point. This makes them more and more disobedient and selfish. These cursings might make them hate God and others more, making them even more filled with pride. The bottom half of the diagram can be a very vicious cycle. But the opposite is also true. Those who choose to be humble become obedient and selfless. They are blessed. But when they are blessed they can again choose to be humble. This renewed humility can bring about more obedience, more selflessness, and even greater blessings. This could result in something that is the opposite of a vicious cycle— it is a virtuous cycle. There is one more reason why I love this diagram: it reminds me that at every moment of my life I am choosing. I am choosing whether I will be humble or proud. I know the consequences of either choice— they are clear from the diagram. So this diagram raises these questions for me. How can I be more humble? 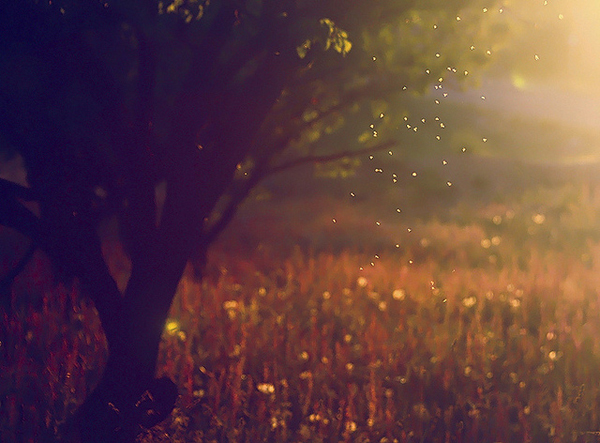 How can I show greater faith and trust in my Heavenly Father? How can I be more obedient so that He can bless me with selflessness? Finally, if one looks carefully, there are places in the Book of Mormon where people avoid the negative and oversimplified pride cycle and instead choose humility. (To see this, I would suggest looking at Alma Chapter 1). My oldest child will turn eight later this year. I wanted him to take the missionary discussions before getting baptized, but around here at least I seem to be super weird for requesting such a thing. 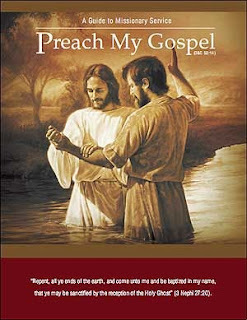 So instead I broke out my copy of Preach My Gospel to bone up on the basics and make sure he is as prepared as possible to make this big decision. I purchased Preach My Gospel when it came out and must have read it, based on the notes I found this time around, but I frankly don't remember any of it. Not the concepts of course, but the specific format or explanation. I did not serve a mission, though I did teach Gospel Doctrine in my ward for five long years which is when I became super scripture savvy. At the end of a section called "Christlike Attributes," there's a quiz. I figured I could count taking the quiz as a full night of scripture reading, right? If you're following along at home, I'm talking p.126. The attributes addressed are: faith, hope, charity and love, virtue, knowledge, patience, humility, diligence, and obedience. There's a five point scale to rate yourself on a total of 57 items broken up into the attributes. There is one area I scored low in and one where I scored exceptionally low. For anyone who knows me, this will not come as a surprise. My worst area was hope. This is a problem for me in all aspects of life. I also scored low, as in needing to work on, the aspect of patience. Again, though I've become much more patient with others especially since becoming a parent, I struggle with being patient with God's timeline and my own inadequacies. I found the quiz helpful in looking at my spiritual strengths (virtue, knowledge, diligence, obedience) and weaknesses. I'd recommend this as an activity for you to complete, on your own or with your family. Read the roundup that started all roundups. This post was originally published on August 25, 2011. This is NOT that kind of site. Go try By Common Consent—I heard there were some leaked photos of Steve Evans. It didn't. What did you end up doing instead? I searched and didn't immediately find anything I was impressed with. Any of our commenters want to venture a verse? 1. Canning - Beef and mutton, fruits and vegetables. 2. Drying - Corn, beans, peas, fruits. 3. Sewing - Remodeling men's and boys' coats and suits. Remodeling women's and girls' dresses, house dresses, aprons. Making men's shirts, ties, underwear, sleeping garments. Making layettes. Rugs. 4. Farming - Wheat, sugar beet seed, beans, potatoes, beets and vegetables and fruits, etc. 5. Shoe repairing and making. 10. Buildings - Recreational halls and gyms; remodeling buildings; assisting distressed families in remodeling and building homes; ward chapels; renovating and redecorating; beautification projects; storehouses and root cellar construction. 12. Cement building block manufacture. 13. Sorghum and molasses manufacture. 14. Furniture repair and manufacture. 15. Toy repair and manufacture. 17. Community hospitalization and medical treatment. 20. Storehouse storage and distribution. 22. Reclamation and dam construction. 23. Vocational training of boys. 24. Manufacture of sprays and disinfectants. 26. Temple projects for elderly people. 27. Occupational training for girls. 28. Manufacturing and assembly of tractors for all purpose farm work. Generally I don't like the television show from a few years ago called What Not to Wear. The premise is that people will nominate their poorly dressed friends or family members to receive a $5000 gift card to be spent on new clothes. The catch? They must endure two nosey hosts ridiculing them on national television for disregarding current fashion trends in lieu of their personal sartorial proclivities. While I admit that people generally dress better post-makeover, I hate that the show seems to purport that you can't be happy or successful in life if you don't spend $600 for a pair of shoes. And Clinton is a total hypocrite – he dresses worse than most of the contestants in my admittedly worthless opinion. I think people, within the limits of good taste and some circumstance, should dress in a way that they feel comfortable. And snobby, New York, hipster-doofuses shouldn't be able to tell them otherwise, even for five large. For the love of the children, DEACONS, fix your back collar. Why is it that when you look up at the sacrament table, there's a group of 6-9 boys that seem to have a full inch of tie hanging out the back of their collars? We actually call this "deacon tie" in our household. And another thing to note – if your tie doesn't come within six inches of your belt buckle, you tied it too short - I don't care how big your gut is from playing Xbox all summer. The "uniform of the priesthood" this is a myth. In fact, that term almost offends me. You do not have to wear a white shirt and tie to pass the sacrament. Straight out of the Church Handbook of Instructions, Book 2, "Ties and white shirts are recommended because they add to the dignity of the ordinance. However, they should not be required as a mandatory prerequisite for a priesthood holder to participate." So if someone tells you must wear one to pass the sacrament, look at them condescendingly and give a little half-snort of derision and pity. The following is an anonymous guest post in what will be a three-part series on disfellowshipment. Submit your own guest post via email. Read Part 1 here. My bi-weekly meetings with the Bishop began. He was supportive and encouraging even though I was slipping all over the place. He gave me things to read, called me throughout the week just to say hi, and was a good friend. I never felt damned or nervous entering his office. Truly an inspired man. So what is the hardest thing about being disfellowshipped? For one, rejecting the sacrament is always a little awkward, especially when the one passing is your new member friend. You know what's going on in his mind. "Huh? It's bread. Eat it. Take it. Hurry. I'll wait here. Can he see me? Why is his hand shaking back and forth? Not hungry? Okay then." Perhaps the most difficult experience was one day when I got an email at work that said, "Come home. Emergency." sent to me by my mother. I slammed the gas down as I raced home to find my mother screaming in pain holding her leg, which had come out of its socket, taking a chunk of bone with it. How? Bodies are weird. I couldn't give her a blessing. She asked and I had to say, "I can't." It was a terrifying answer in response to her shrill plea. There are small things that you wouldn't normally think about, like saying prayers during class time. Unless you have Brother Overachieving-Organized-Do-No-Wrong-Planner-Guy who plans prayers ahead of time, teachers usually ask people to give invocations and benedictions 3.5 seconds before class begins. It works out, unless they asked me. In one case, the Sunday School President called on me right after the lesson giver had said Amen. I had a buddy clue in and volunteer immediately. Whew, one more invitation to say the prayer and I would have been out of there. I'm one of those people who never understood why someone would stop coming to church because they were offended, until that moment. Thankfully, I stayed and the Sunday School President apologized. Church was really hard during that year.